Basically, you can use this gear as midi through box. One midi stream is divided into 4 individual outputs. If your midi stream that you put into this machine includes midi clock, then this item will convert it into din sync signal and put it in the same connector with midi output. 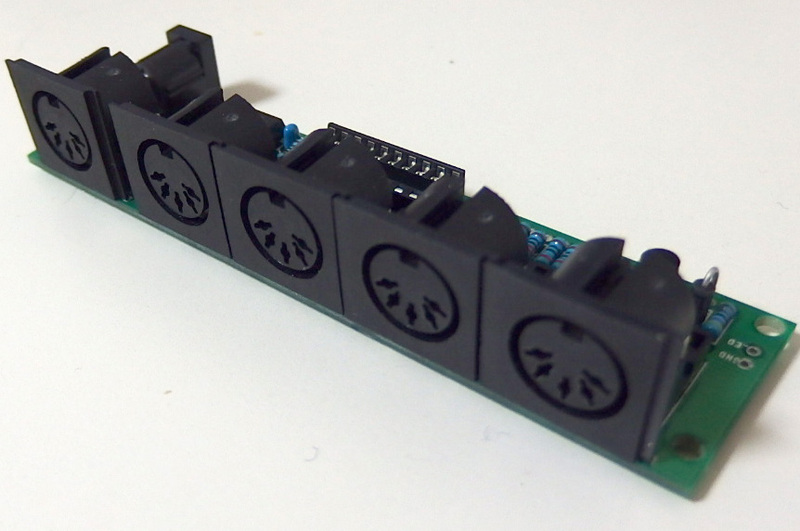 MIDI and din sync use same type connector but they are another kind of signals for each.But they are using another pin structure, so they can use same connector at a time. You can use some output connector as midi output and rest of them can be used as din sync output without any switching.Each of midi message is read through photo coupper, parsed and re-generated by micro processor as restrict midi stream. Each stream of the output of this box has no running status that’s one of legacy standards midi functions but sometime cause some trouble on some simple midi based gear like bassboy. The omitted data from midi stream to make it more first may be added again by this function. It may course small delay on midi data. But it may ok on usual scenes. Enjoy patching your midi based gadgets!